Wittenborg Online: More International Students to Flock to Countries Like the Netherlands as UK Tighten Rules on Non-EU Students? More International Students to Flock to Countries Like the Netherlands as UK Tighten Rules on Non-EU Students? While many European countries, like the Netherlands, have doubled their efforts to attract foreign students in recent years, the UK is about to turn the screws on non-EU students. Changes to be effected include that all part-time work rights for non-EU students studying at publicly funded colleges are to be scrapped, while college-enrolled students will also have no possibility of applying for a work visa while in the UK. The latter means that college graduates hoping for a job will have to apply for a work visa from their home countries, despite graduating in the UK. From next month all non-EU students at public colleges, just like those at private ones, will loose their right to work for up to 10 hours a week during their studies. Other measures - like preventing students from applying to stay on in Britain and work when they finish their course, unless they leave the country first – will be introduced in the autumn. Despite the British tabloid, the Daily Mail, reporting last week that the new rules would apply to all non-EU students, it will in fact only target those in Further Education (FE). The new rules might mean other countries, like the Netherlands with more lenient student visa regulations, can expect more students to flock to their shores. In the Netherlands all international graduates of Dutch higher education institutions can stay a maximum of 12 months after graduation to look for a job – the so-called “zoekjaar”. They are also allowed to work up to 10 hours a week while they are studying. Graduates also enjoy privileged access to the Dutch labour market with lower wage requirements once they’re orientation year expired. 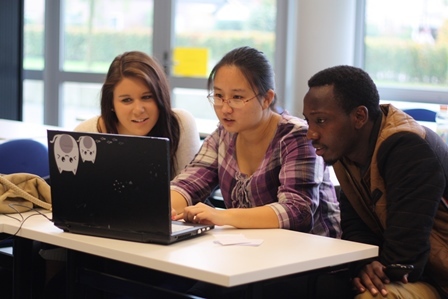 During the zoekjaar international students are free to work in any job without prior approval from the authorities. The Dutch government has in addition launched a programme “Make it in the Netherlands” in an effort to secure the most talented students for its labour market by smoothing the transition from student to employee through language training and targeting scarce skills. In Germany international graduates can stay up to 18 months to look for a job and it serves as a fast-track to permanent residence, which is granted after two years of skilled labour or self-employment. In Canada the length of the post-study scheme extends even further – 36 months! In addition the field of employment does not necessarily have to match graduates’ area of study. They also enjoy priority access to permanent residency. Just last month a study by PricewaterhouseCoopers (PwC) and the business lobby, London First, revealed that international students in London contribute almost €4 billion per year to the UK economy – 5 times more than what it costs to host them. The PwC report indicates that far from being a burden to public services, international students have contributed €3.85 billion in fees and consumer spending to the UK economy, supporting nearly 70,000 jobs. In comparison the costs of providing them with public services dulls to a mere €741 million per year. Yet, many of the students participating in the study complained that Britain’s immigration system has negatively affected their study experience there and the vast majority reported difficulties in securing a job in the UK after their studies. Under current British immigration rules students who wish to stay on in the UK after completing their studies need to work for a single employer and earn a minimum of £20 800 (about €28 884) per year.